A hard drive is one of the most important components of your PC. 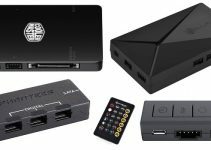 It is the primary storage device of your computer where you store your data and operating system files. Mechanical hard drives are present from a very long time and they are still an inexpensive and widely used storage device even after the evolution of much faster Solid State Drives (SSD). A mechanical hard drive provides your tons of storage space at an affordable price and is also very reliable unless you drop it or incur any physical damage. Internal hard drive is generally the preferred primary storage device for any PC. The performance of hard drives has improved quite a bit over the past by increasing the amount of high-speed cache or buffer. 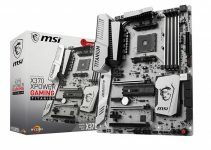 Internal hard drives for PC comes in 3.5-inch form factor and here in this post I am going to list down the best internal hard drives for Desktop PC and for building a Network-attached storage (NAS) Server, Enterprise Server and for use in Surveillance Systems. All the below mentioned hard disks comes with SATA III 6Gb/s interface for faster operation. Here are the top internal hard drives for use in normal PC or in budget to mid-range gaming PCs. Western Digital Blue Desktop Hard Drives are one of the most popular and best-selling hard drives in the market right now. They are reliable, offers good performance and are quite silent too. Also the power consumption of these hard drives is moderate.Western Digital Blue Desktop Hard Drives comes in capacities of 500GB, 1TB, 2TB, 3TB, 4TB and 6TB. The 500GB and 1TB versions comes with spindle speed of 7200 RPM while higher capacity models have got spindle speed of 5400 RPM. With lower RPM speed, performance do take a little toll but you will get larger storage space. 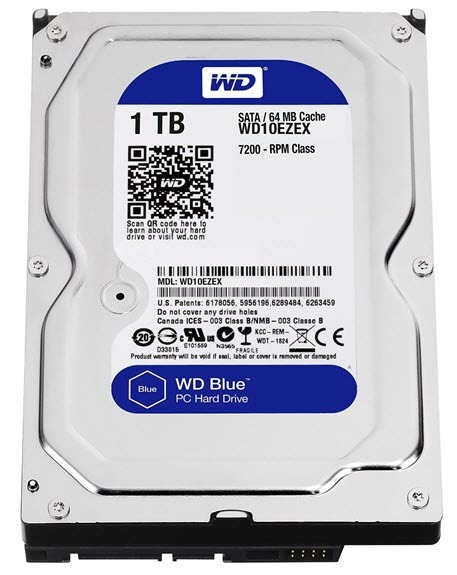 Here we have got 1TB model of WB Blue hard drive and it comes with 7200 RPM and 64MB cache. This internal hard drive offers a good balance between performance and storage space. So if you are looking for a cheap, fast and high performance internal hard drive for your gaming or normal PC then this hard drive will never let you down. Highly Recommended by me. Seagate is a big big name in hard drives and is the main competitor of Western Digital. Here we have Seagate BarraCuda hard drives that comes with capacities in 4 TB, 3 TB, 2 TB, 1 TB, 500 GB. The BarraCuda desktop hard drive series from Seagate offers good amount of performance and are quite power efficient too. 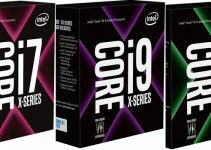 These internal hard drives are best suited for home desktops, all-in-one PCs, budget gaming PCs and Entry-level direct-attached storage devices (DAS). 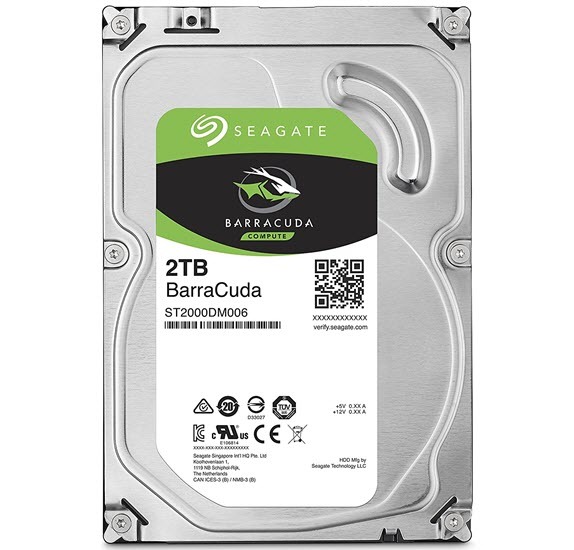 The 2TB variant from this BarraCuda series offers great value for your money and it comes with 64MB cache and 7200 RPM Spindle speed. So if you are looking for a fast, high storage, trusted and durable hard drive then you must go for this. 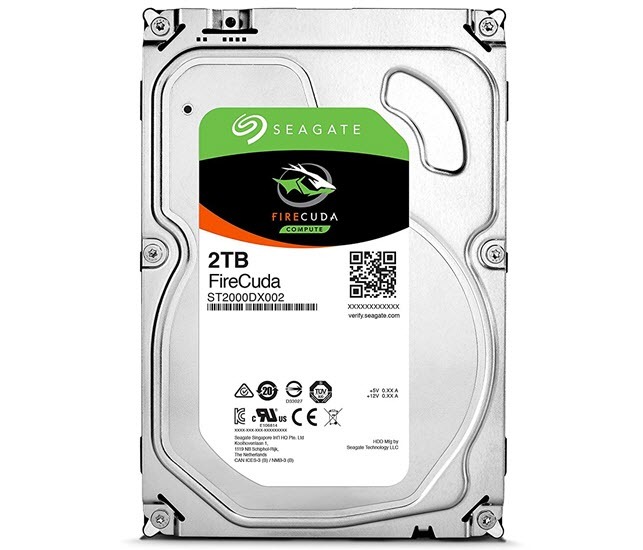 The FireCuda range from Seagate consists of Solid State Hybrid Drives (SSHD). SSHD is a hard drive that has small amount of flash storage built in it for speeding up the hard drive. The majority of the space in a SSHD consists of mechanical disk and only part of storage i.e. 8GB or so is the flash based memory. The controller chip decides which data is to be stored on flash memory and which one on the mechanical disk. The mostly used programs or operating system files are often stored on the flash memory only. It is a hybrid of both HD and SSD and therefore it called as Solid State Hybrid Drive or SSHD. These SSHD drives are faster than the traditional mechanical hard drives because of the faster flash memory they possess besides cache. In general, they are about 5x or five times faster than the normal mechanical hard drive. Seagate FireCuda 3.5” hard drives are available in two capacities of 1TB and 2TB. Here we have the 2TB variant that comes with 64MB cache and has got spindle speed of 7200 RPM. This is a very fast hard drive and are suited for anyone building a gaming PC or a high-performance workstation for professional work. FireCuda internal hard drives also come with much longer warranty compared to the standard internal hard drives. So if you are looking for both high-performance and large storage then FireCuda drives will certainly make you happy. Frankly I am not a fan Toshiba hard drives but this Toshiba internal hard drive has really impressed me with its performance and price. 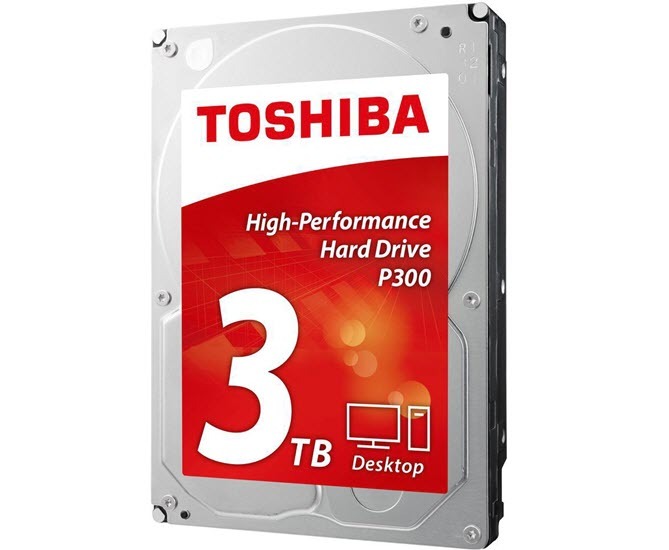 Toshiba P300 is a high performance hard drive that comes with 64 MB cache and has got high spindle speed of 7200 RPM. The drive is available in 500GB, 1TB, 2TB and 3TB capacities. You can use this internal hard drive in gaming PCs, desktop workstations, all-in-one PCs and for normal desktop PC. This drive is fairly reliable and it supports Native Command Queuing (NCQ), Internal shock detection and ramp-loading technology and Perpendicular Magnetic Recording (PMR) technology. Here are the best NAS, Enterprise and Surveillance internal hard drives for home, office, business and industrial use. These professional hard drives are a bit different from the traditional desktop internal hard drives as they come with totally different firmware and are designed for continuous usage. Some of these drives also come with more robust components for longer life compared to the normal desktop hard drives. You can use FreeNAS operating system to build a NAS server for home or office using these high performance NAS internal drives. WD Red NAS Hard Drives are the hard drives that are designed for use in NAS systems and are optimized for constant read and write operation. These are robust hard drives and are compatible with almost all NAS systems or softwares. You can configure these NAS drives in RAID and build an efficient and powerful NAS server for office, home or business use. WD Red NAS drives in capacities of 2TB, 3TB, 4TB, 5TB, 6TB, 8TB, 10TB and with 64MB, 128MB, 256MB cache. All of these internal drives have spindle speed of 5400 RPM. 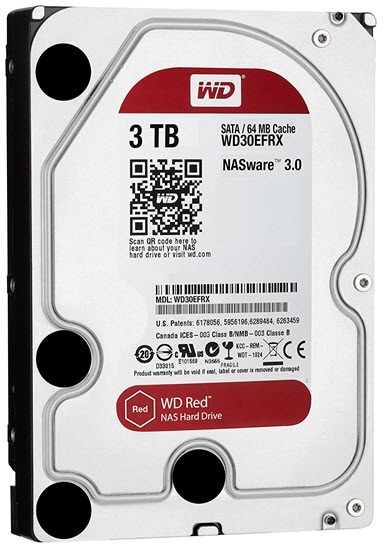 Here we have the 3TB version of WD Red NAS drive which comes with 64 MB cache. Higher capacity drives i.e. 8TB and 10TB ones comes with 128MB and 256MB cache respectively. These NAS drives are tested in 24×7 conditions for demanding environments. This is a fairly quiet NAS drive but do not expect it to be super silent. Overall it is a high quality and robust NAS drive and it provides most bang for your bucks. Here we have NAS disk drive range from Seagate which is Seagate IronWolf. These NAS internal drives are designed to work in 24*7 environments and they come in capacities of 1TB, 2TB, 3TB, 4TB, 6TB, 8TB and 10TB. Drives with capacities from 1TB to 4TB comes with 64MB cache and 5900 RPM spindle speed while 6TB to 10TB drives have got higher spindle speed of 7200 RPM and 256MB cache (128MB for 6TB). If we compare the specs, then these drives are bit faster than the WD Red NAS drives mentioned above. Seagate IronWolf are perfect drives for NAS, Desktop RAID, servers and for small businesses. So if you are not into Western Digital and want something a bit faster, then you must go with these NAS drives from Seagate. 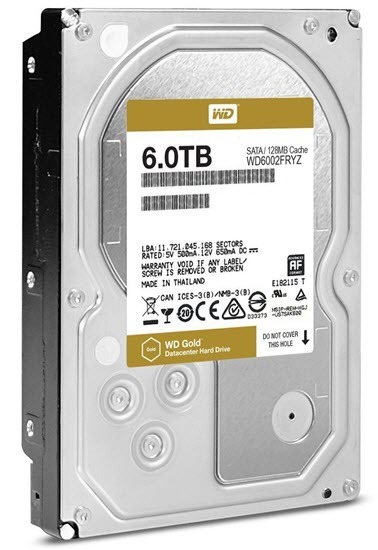 Here we have WD Gold which is an Enterprise Class Hard Drive for use in enterprise servers, datacenter servers, high-end servers and heavy duty storage systems. These are heavy duty hard drives that are designed to work continuously in 24x7x365 environments. WD Gold Enterprise Class Drives comes in capacities of 1TB, 2TB, 4TB, 6TB, 8TB, 10TB, 12TB and have got 7200 RPM Spindle Speed. The cache in these drives ranges from 128 MB to 256 MB. The major features of these Enterprise Class Hard Drives include Vibration Protection, HelioSeal technology for reliability & high storage, RAID-specific, time-limited error recovery (TLER), Dynamic fly height technology. These enterprise level hard drives have got reliability of 2.5 million hours MTBF. Here we have the 6TB variant of WD Gold Enterprise Hard Drive that comes with 128 MB cache and offers a great balance between high storage and affordable pricing. WD Purple Surveillance Hard Drives are designed for use in DVR, NVR, Video Server, Security System or Video Monitoring Systems. WD Purple Hard Drives are designed to work in Surveillance systems with continuous usage. These WD Purple Surveillance hard drives are built for 24*7 usage and can support up to 64 cameras, and can record videos in high-definition (HD). These Surveillance drives comes in capacities of 1TB, 2TB, 3TB, 4TB, 6TB, 8TB, 10TB having spindle speed of 5400 RPM. 8TB variant comes with 128 MB cache, 10TB one with 256MB cache while rest of the WD Purple drives come with 64MB cache. WD Purple Surveillance drives comes with AllFrame 4KTM Technology that reduces frame loss, improves video playback and optimizes the drive to work in challenging environments where continuous operation is needed for surveillance. These drives can sustain high temperature and they are built and optimized accordingly. Work load rate supported by these surveillance drives is 180TB/yr and they support TLER & ATA streaming. 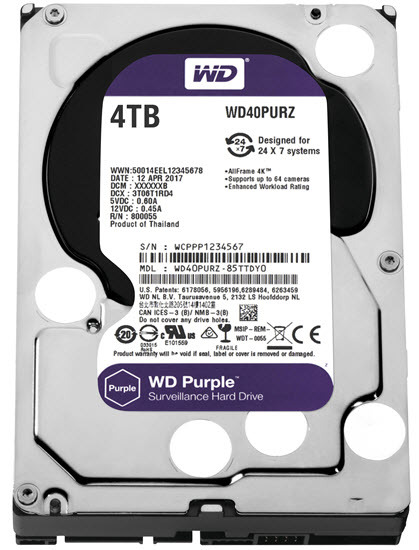 Here we have the 4TB variant of WB Purple HDD that comes with spindle speed of 5400 RPM. So if your main purpose is surveillance then you must choose these specialized drives. Here we have Surveillance Hard Drive from Seagate which is Seagate SkyHawk. This Surveillance Hard Drive comes in capacities of 1TB, 2TB, 3TB, 4TB, 6TB, 8TB and 10TB. Higher capacities versions i.e. 6TB, 8TB and 10TB variant comes with 256 MB cache and others have 64 MB cache. These drives have got spindle speed of 5900 RPM and are suited for use in Network video recorders (NVR), Embedded surveillance DVRs (SDVR), Hybrid surveillance DVRs, Surveillance DVRs. Seagate SkyHawk has maximum Workload rating of 180TB/year and supports up to 64 cameras. The drive is fast enough to record HD videos. 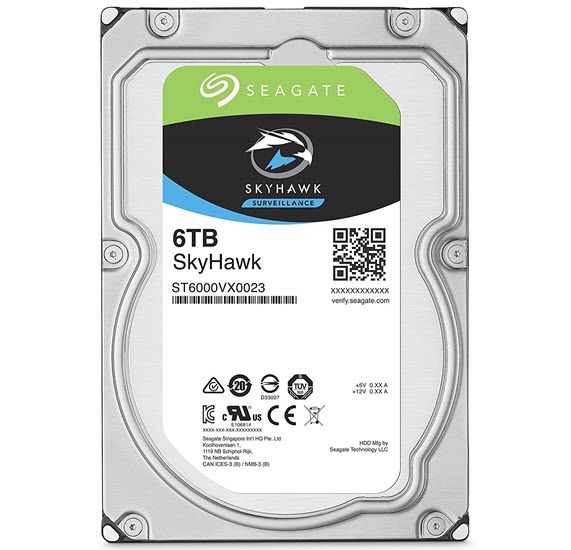 Here we have 6TB variant of Seagate SkyHawk that comes with 256 MB cache. Seagate SkyHawk drives can be a little faster than the WD Purple because of higher cache and slightly faster rotational speed. At the end, I would like to say that nowadays you can find specialized hard drives for different purpose or use and this can really increase the productivity and performance of your specialized systems. For desktop use, there are desktop hard drives and for servers and surveillance systems different hard drives are available. It is better or advisable to use the proper hard drive designed for a particular system otherwise you may face serious issues with performance. Above I have mentioned all the best internal hard drives for different purposes and if you have got any queries regarding them, then you can ask me your queries by leaving a comment below.